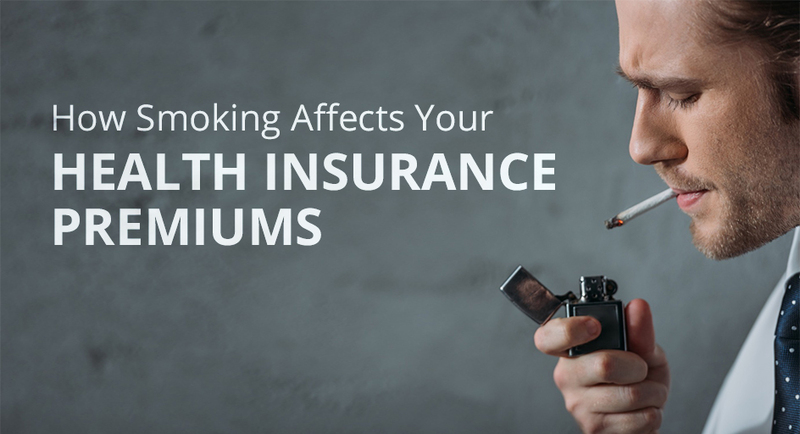 You are probably aware of how smoking can affect your health, but do you know how it changes your health insurance premiums? Health insurance premiums are determined based on five factors: age, location, plan category, number of dependents, and tobacco use. Insurance companies define tobacco use as the use of tobacco products (cigarettes, cigars, pipe tobacco, and chewing tobacco) on an average of four times a week and within the last six months. Health insurers cannot outright deny coverage to smokers, but they can charge them higher premiums than non-smokers. The Affordable Care Act allows insurance companies to charge smokers up to 50% more for premiums. The explanation for this is simply that smokers are more likely to develop health concerns in the future, and therefore represent a greater risk for insurance companies. This surcharge is also known as tobacco rating, and states may opt out or charge below 50%. At this point most states charge the maximum 50% rate, but there are a handful that have taken the other options. It is important to point out that when applying for health insurance, lying about your smoking habits in order to receive lower premiums is considered a form of insurance fraud. In effect, by lying about tobacco use you are misrepresenting your health risks. Even if you use a smoking cessation device such as a vaporizer or an e-cigarette, many insurance companies will still consider you a smoker and raise your premiums in the same they will for tobacco product users. Because of the higher premiums, some smokers may opt out of health or life insurance altogether. This can be a costly mistake due to the increased risk of diseases that commonly arise from long term tobacco use. If an uninsured smoker does become diagnosed with something like cancer or heart disease, they will surely wish they had insurance coverage to assist with treatment. There is some disagreement over whether higher insurance premiums actually help people stop smoking, but there are some providers that offer coverage for smoking cessation programs as preventative care. Having healthy habits is not only beneficial to your wallet; it is also beneficial to you and those who love you the most. Health insurance can help ensure that you’ll be there for family and friends for many more years to come. Reach out to one of our agents today to learn more about what you can be doing to take precautions for the future of your health.